King Street Sounds celebrates its double decade-long love of house music with one of its foremost heroes, Louie Vega. Louie has won two Grammy Awards, been part of one of the most influential house music production teams - Masters At Work - launched projects like Nuyorican Soul and Elements of Life and released productions on his Vega Records. In this time King Street has also seen its share of successes, working with Louie and launching two sister labels, Nite Grooves and Street King, creating a catalog of over 1800 titles, a few mainstream chart toppers, and contributing to the early careers of some of the most world- renowned artists in house music; namely DJ Pierre, Satoshi Tomiie, Cevin Fisher, Dimitri from Paris, Roland Clark, Blaze, Tony Humphries, David Morales, Danny Tenaglia, Kerri Chandler, Dennis Ferrer, Joe Claussell, and many, many others. 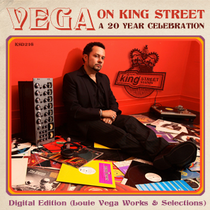 Louie Vega and King Street have come together once again to mark the label's 20th Anniversary. This momentous occasion is marked by a double release on CD with an homage being paid to the Master at Work himself. On this time Louie returned to his lab and re-worked Dennis Ferrer feat Mia Tuttavilla's track ‘Touched The Sky’, and has especially created his very own intermittent Vega beat original floor fillers, namely 1, 2, & 3, which are mixed throughout various segments. Other highlights on this comp include Jon Cutler's dub of Kimara Lovelace's ‘Far Away’, Mr.V's 5 Beats Mute Pass of DJ Roland Clark's Have A Good Time’, the Kerri Chandler Kaoz 6:23 Dub of Studio Apartment feat. Monique Bingham's ‘Found Him’, the Teddy Douglas Re- Edit of Pastaboys Main Mix of Ananda Project's club hit ‘Where The Music Takes You’ and quite a number of other notables. It’s out March 26.